One of the most common classes of partial differential equations is the class of elliptic partial differential equations. We have not delayed the discussion of elliptic equations because we do not feel that they are important. We have done so only to keep the topics on parabolic and hyperbolic equations together (because so many of the topics related to these types of equations are similar). 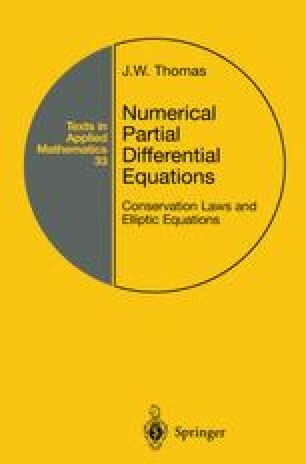 Elliptic partial differential equations are fundamentally different from parabolic and hyperbolic partial differential equations, and the numerical schemes for approximating solutions to elliptic partial differential equations are fundamentally different from the schemes for approximating solutions to parabolic and hyperbolic partial differential equations. The class of problems involving elliptic partial differential equations is a very important class of problems. Simulations of steady heat flows or irrotational flows of an inviscid, incompressible fluid; pressure computations for either the flow through a porous medium or that associated with the flow of a viscous, incompressible fluid; and many others all involve solving elliptic equations.